Just a quick check in as I head out for another quilt show. I had a fabulous time at the “Garden Party Quilt Show” in Lompoc, Ca this last weekend. The members there are just the best. They treated us all so well and we enjoyed all of there lovely quilts. There was a Mini Quilt Raffle and when I walked in and saw around 35 Mini Quilts all around 12″ x 12″ I thought I was in Twilt Heaven. Quilters Etc has a DVD of their quilt show available and it includes the Mini Quilts. I had to bid on a bunch of them and usually I am not that lucky but luck was with me last week end and I won this Mini Quilt that qualifies as this Tuesday’s Twilt. It was made by Kathi Costa Downey of Lompoc and is hand pieced, appliqued and quilted. Click on the picture to see a larger view of Kathi’s handwork. A big Thank You to the members of Quilters Etc for a wonderful show and a special Thanks to Kathi for making this Mini Quilt so I could win it. Yeaaa! There are so many new techniques and products available these days. 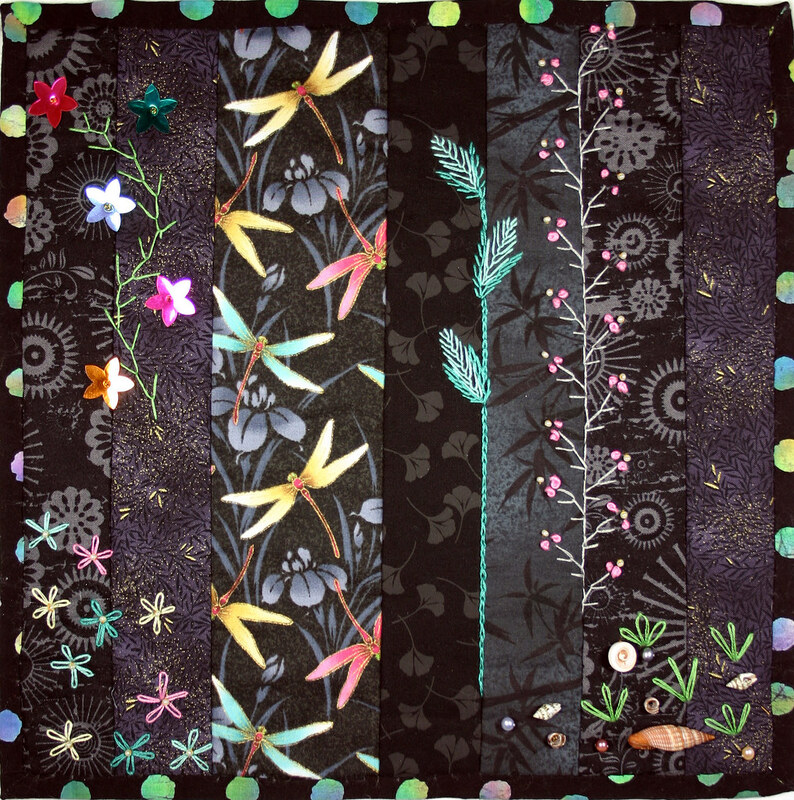 Art quilting has become the rage and the possibilities have been calling to me for a long time. The Twilt project seems the perfect place to try out some new techniques. For “In the Strata” I used torn strips of painted silk, organza, metallic silk organza and a bit of yarn. I laid the strips over a base of cotton with light fusable web and bonded them to the surface. 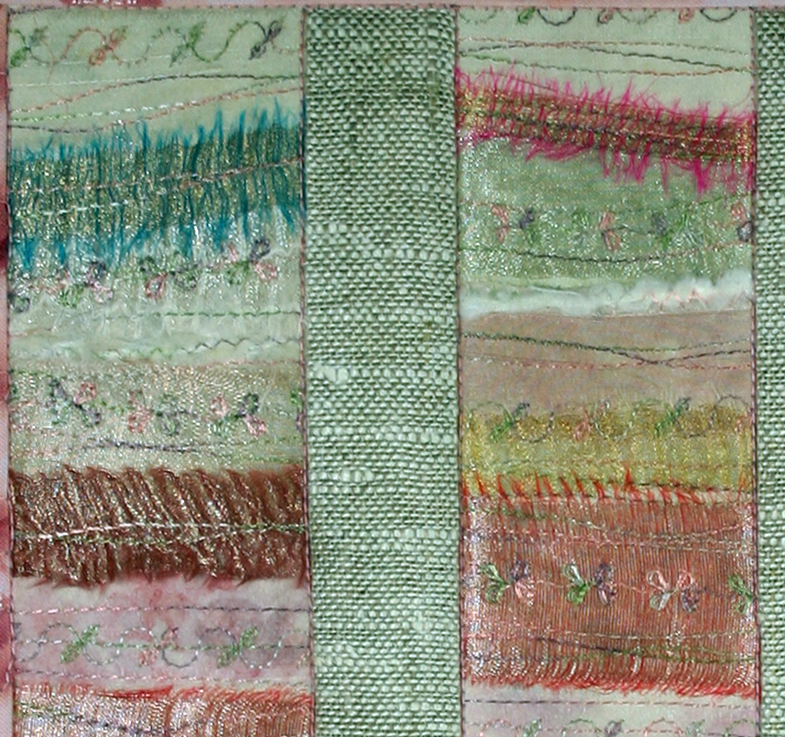 The strips were then stitched with Rainbow thread from Superior in the same direction, using the stitches on my machine, a flower stitch, a leaf stitch and straight stitch. I then bravely cut my piece into three sections, inverting the center and stitched linen in between. I thought the directional cherry print complimented the strata of the experimental piece. I will probably go back and add embellishment to this piece but since it’s Twilt Tuesday here it is, as is. 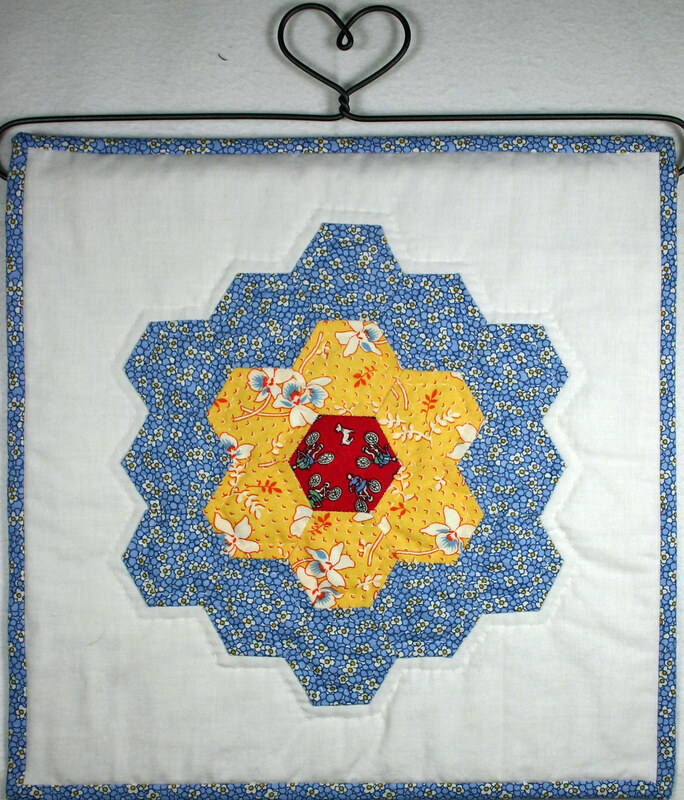 Hibiscus Flower features a new block of mine called the Dresden Flower block. It has 3D corners that are rolled during quilting. 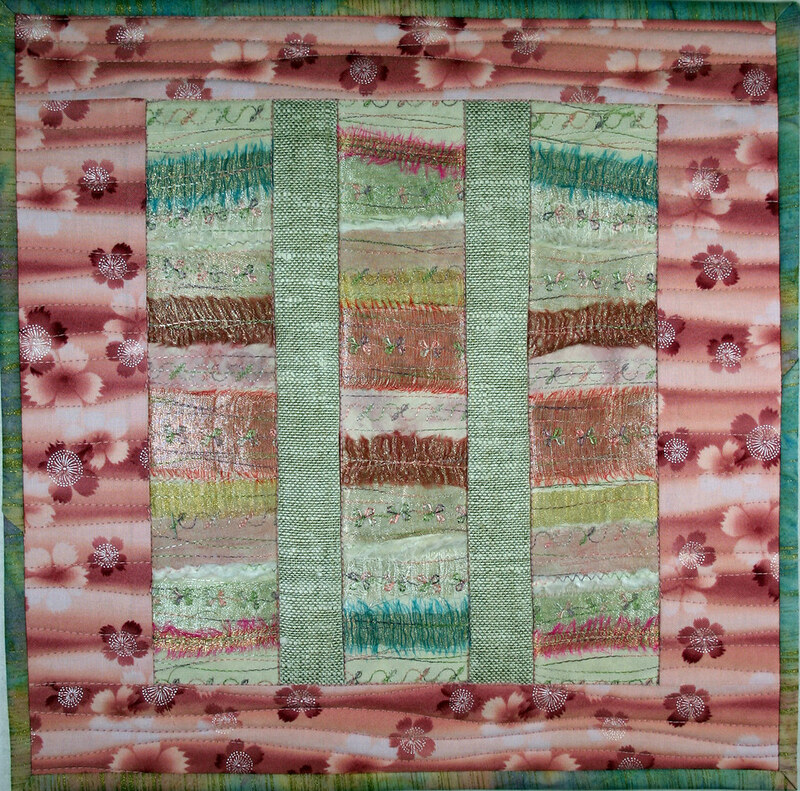 I have a big quilt using this block in the quilting stage so watch for it in the future. 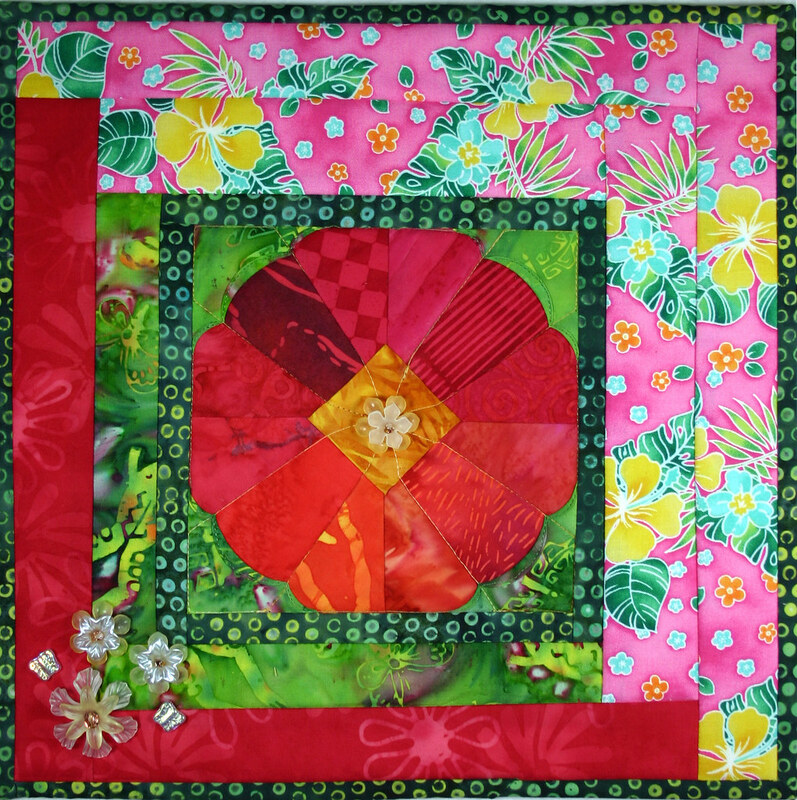 A couple of the fabrics in this piece were picked up during my recent visit to Hawaii. This morning as I sipped my coffee and typed away on my latest project I started to hear the sound of sirens. As the sound got closer and the sirens more numerous I paused and waited. I live on a main street that cuts through town and leads to the hills behind the neighborhood where I live. Quite a few fire trucks rushed by including City of Banning and CDF vehicles. As the minutes passed trucks from nearby cities also rushed by. I couldn’t see any smoke, so I gave in, grabbed my camera and heading off on foot to see what was up. Up the road, past the cemetary and on out past the homes we had a brush fire in the Mias Canyon. The ground crews were out of my view but the Fire Fighting planes and helicopters were doing an awesome job and I snapped a few pictures. I think they have this one under control but I am sending out my biggest hopes and wishes that our fire fighters stay safe and I hope everyone makes it though the fire season safe and sound! It’s been a while since I posted but I am back now. I took some R&R, did some work and enjoyed the summer. It’s time to get back to my friends in the blogosphere though. Early in August, just after the Long Beach Quilt Show I went to Hawaii to visit my son, Raymond. He lives in Kaimuki, a little town just south east of Waikiki and Honolulu. Hawaii is such a beautiful place and it was fabulous to see him. I didn’t take any quilting related supplies with me other than a bit of handwork. Imagine my surprise that within walking distance of Raymond’s home I found the Kaimuki Dry Goods Store and a little bead store called Bead It. I collected supplies to fashion my Hawaiian Twilt completely by hand. The Dragonfly fabric became the focal point and I stitched the strips to each other by hand through the batting and backing. Embroidery floss, flower sequins, beads, pearls and shells were added for embellishment. I rolled the backing to the front and stitched the binding by hand. I think this twilt will always have special meaning to me because while I created it I explored Kailua, Waikiki and Honolulu with my son.